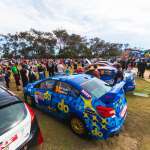 Subaru do Motorsport’s Molly Taylor and Malcolm Read have had a disappointing end to their 2018 CAMS Australian Rally Championship, a high speed crash this morning forcing their retirement from the three-day Kennards Hire Rally Australia. Taylor and Read were sitting fourth in the ARC pointscore and still had a slim shot at the 2018 title. However, it all came unstuck on this morning’s second stage when the Subaru WRX STi left the road and collided with a hay bale, which was positioned to guard a tree trunk. The Subaru crew were checked out by medical staff on stage after reporting soreness and were subsequently transported by a rally Medical Intervention Vehicle to the rally village medical centre for further medical checks. Both report soreness but no other injuries. It was another story for the team’s WRX STI, which was badly damaged in the engine bay area, firstly by the impact and secondly by a car fire. The stage was stopped for a period to enable emergency crews to access the incident, which occurred 7.2 kilometres into the stage.